Some of my favorite transformations are the ones that involve simple updates. 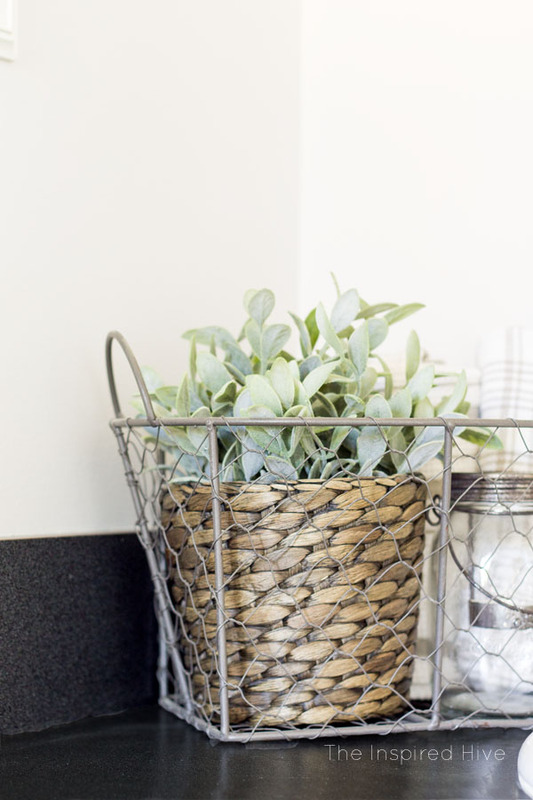 Don't get me wrong- I love a huge overhaul of an awful space, like the incredible before and after of our playroom makeover, but I also love the huge difference that little things like a bit of paint and some new hardware can make. 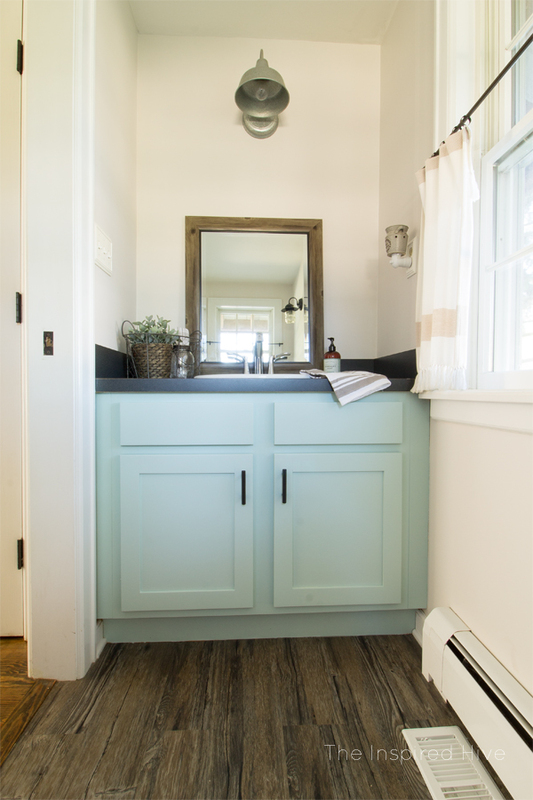 I recently shared with you our design plan for our powder room, and I'm excited to show you phase one today!! We still have a long way to go, but it already feels so much better. Our goal in this first phase was to quickly make it feels more "us" and to keep it simple. Sherwin-Williams provided product for this post. As always, all opinions are my own. I am always blown away by how different a room feels with a fresh coat of paint. 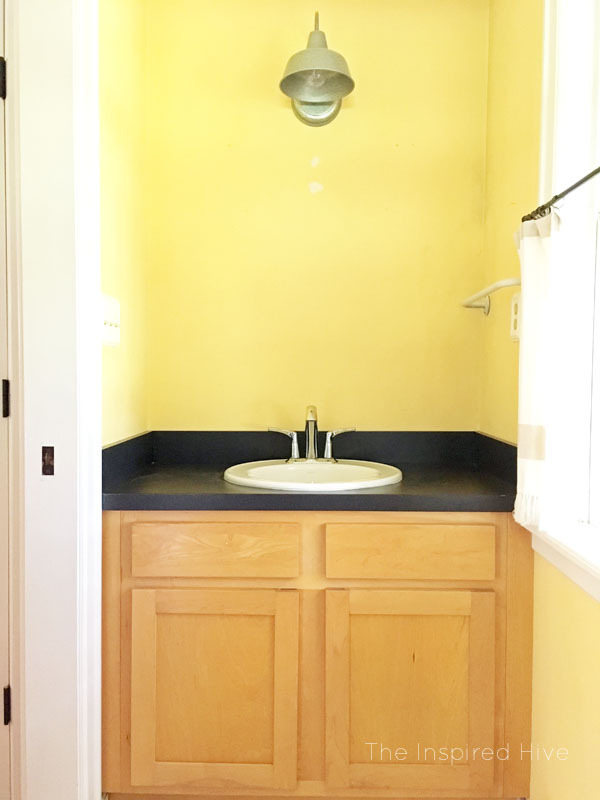 We covered those yellow walls with Sherwin-Williams "Eider White," my favorite go to barely-there greige. The room feels so much brighter and bigger! If you want a small space to feel larger, choose a light shade! Our bathroom had old ugly linoleum sheeting on the floor. We plan to eventually tile the floor, but we wanted to do something quick and budget friendly for now. We want to live in the house a little longer before making more permanent decisions, like tile. In the mean time, we installed peel and stick planks right on top of the linoleum (I highly recommend giving the floor a deep clean using a TSP cleaner before applying the planks!!!) We updated this floor for $35 with this case of peel and stick planks. I couldn't believe we got away with spending so little money on the floor! 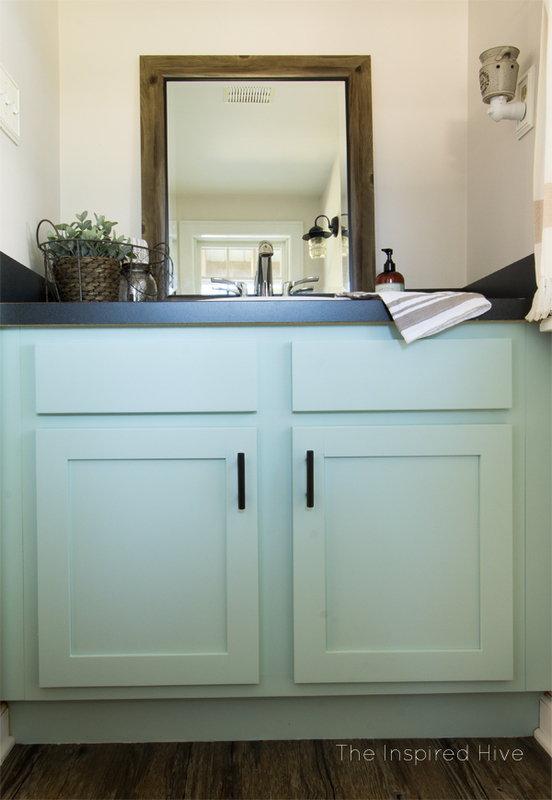 I had my heart set on minty cabinets. I'm a lover of neutral colors, but I've also always been a huge fan of all things in the mint/teal/turquoise realm, and I wanted to add a little pop of color to this room. 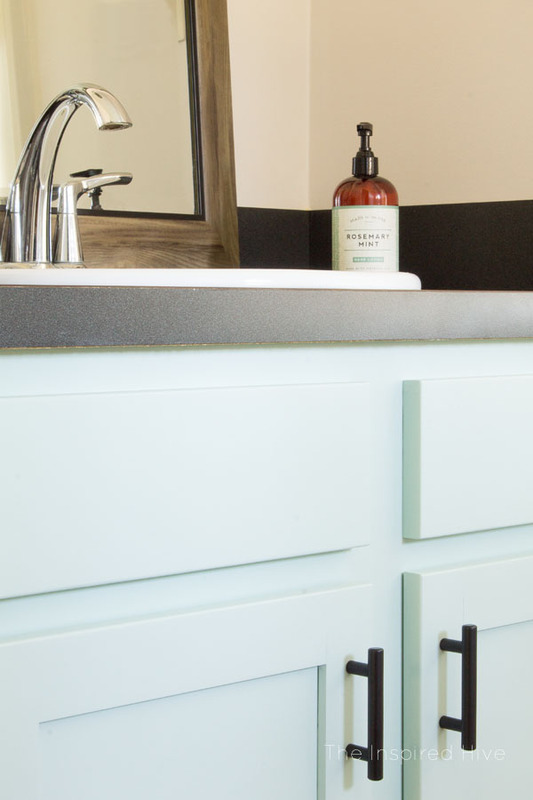 I searched for the perfect subtle mint and settled on Sherwin-Williams "Waterscape." 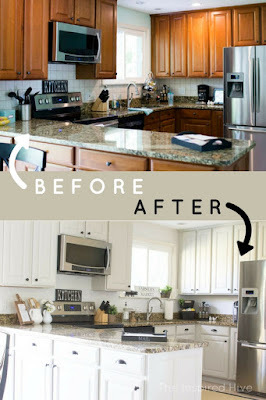 I pretty much followed the same steps as I did when I painted our kitchen cabinets, except I only used a brush, not a sprayer, since there were only two cabinet doors. 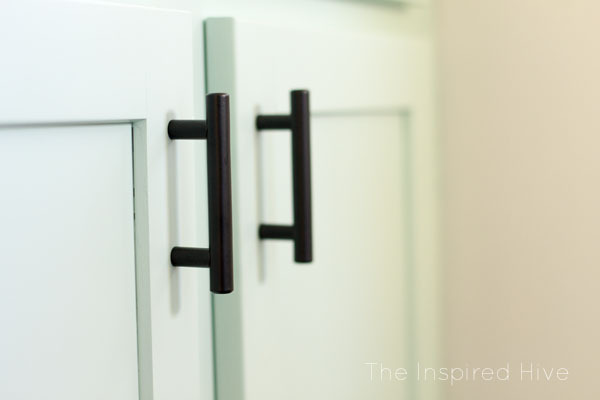 Our cabinets didn't have any hardware, so I decided to add some matte black pulls. 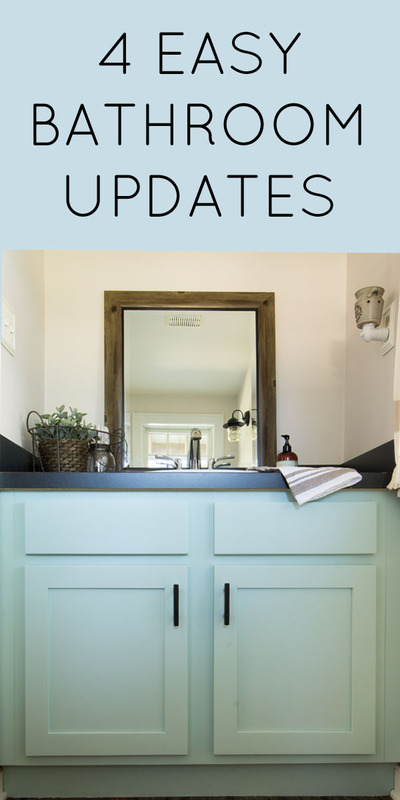 While pulls aren't totally necessary, I think they're a great easy and affordable way to upgrade cabinetry. Floors- Traffic Master "Walnut Ember Grey"
Have you ever painted cabinetry? 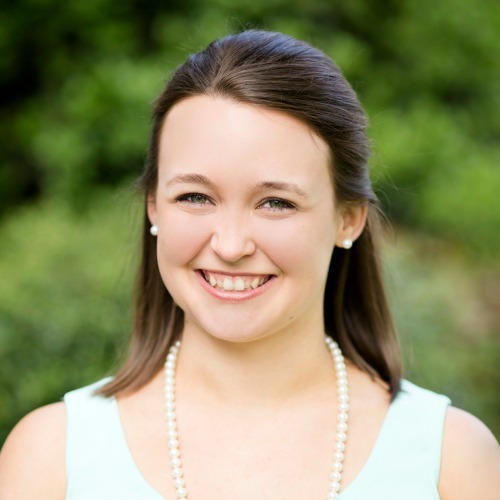 I would love to hear about your experience!! Oh man! I just painted my in laws kitchen cabinets wth the SW Emerald Urethane trim enamel and though it looks beautiful, it’s been 5 days and still isn’t hard and scratches off easily. How long did it take yours to get really hard? Hi! I apologize I didn't see your message until now! I'm sure you have found a solution by now, but this paint seemed fully cured to me within a week or so. It's a really tough cut and I greatly prefer it to the paint I previously used on our kitchen cabinets. I'll be using this from now on!